Posted 6/12/13 – Marilyn Alice Zaiss, beloved Mother and Grandmother, died peacefully at home, surrounded by loved ones, on June 4, 2013. She was born in Pasadena on March 21, 1923, and was the only child of Guy and Alice Hodgkins. Her maternal grandfather was prominent Pasadena-area builder Peter Hall. She was the widow of Walter E. Zaiss, a World War II veteran, who passed away in 2001, and is survived by her son James Zaiss, daughter Shirley Perez, son-in-law Joe Perez, and granddaughter Alissa Perez. Mary was a graduate of Marshall High School and attended Pasadena Junior College. 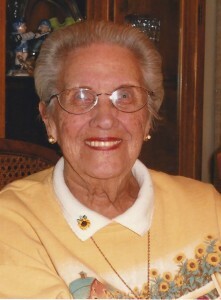 During WW II, she worked as a lens grinder for a piezoelectric products company in South Pasadena. She married Walter in 1945, and in the early 1950s they moved into a house he built in Sierra Madre, where she continued to live for the rest of her life. Mary had been a member of various local organizations, including the Sierra Madre Rose Float Association, the Sierra Madre Hospital Women’s Auxiliary, and the Sierra Madre Women’s Club. Her hobbies included bowling, doing crossword puzzles, and painting plaster statues. She was loved by many, and will be missed. Services will be held at Pioneer Cemetery, date and time to be announced.